America's national parks are fantastic, this we know. But if you want to visit any of the best ones, it often means fighting hordes of visitors taking pictures with iPads and wearing dress loafers when they go hiking. So, how do you enjoy the spectacular scenery without the not-so-spectacular tourists? Well, much like a 1960s draft dodger, you head north of the border to Canada. 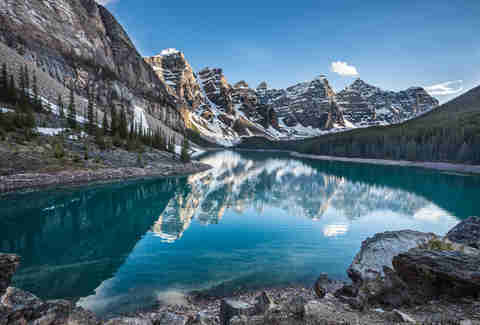 During the summer (and, really, during the winter too) the nature in Canada's 44 national parks is some of the world's most incredible. The sheer vastness of the country lends itself to a diversity of landscapes -- from sweeping beaches and arctic tundra to sandstone towers and mountain lakes. And the best part? Many are visited by a fraction of the number of people you'll find at similar spots in the US. So grab your passport and brush up on your Canadian slang, here are a dozen parks you should visit this summer. Believe it or not, the northeastern provinces of Canada were a tropical paradise about 500 million years ago. 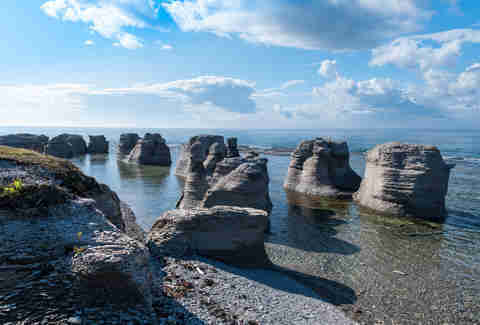 And the seashells and marine deposits that settled there eventually turned to rock and formed a 93-island archipelago off the coast of Quebec. In addition to the towering limestone stacks and hidden grottoes formed by erosion, the islands maintain a rainforest microclimate and are home to plant and animal life you won't find in other parts of the country. Must-do: Stroll the Betchouane Migratory Bird Sanctuary and see nesting puffins and razorbills, then continue along the trail to the park's historic lighthouse. The scenery in Jasper and Banff is the stuff of travel-guide covers: glacial ice fields topping rugged mountains set behind clear blue/turquoise waters in front of cloudless skies. All populated by bighorn sheep, caribou, elk, bears, and other wildlife. Not only that, but the park is recognized as a Dark-Sky Preserve by the Royal Astronomical Society of Canada, which means it's literally one of the best places IN THE WORLD to go stargazing. Must-do: The Dark Sky Festival. Every October, astronomers, entertainers, and just people who enjoy a lack of light pollution converge on the park for a weekend of parties, concerts, and exhibitions that all revolve around looking at stars. Perhaps the most captivating thing about this park isn't the polar bears, or the Saglek Fjord at the southern boundary, or Eastern Canada's highest peaks. It might not even be the northern lights you can see while camping on the shores of a mountain lake. The biggest attraction here is cultural: It's the only park in the world where the entire staff is Inuit, which means you'll learn, interact, and maybe even befriend people from a culture you likely know nothing about. Also, the fishing isn't bad either. 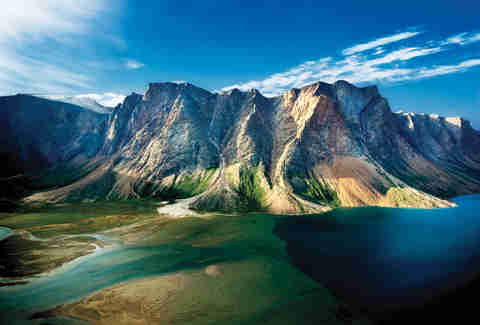 For a rugged, remote, subarctic Canadian wilderness adventure, there's no place like Ivvavik. And the best way to explore it is by catching a prop plane to Sheep Creek base camp. From there, your options are boundless and include everything from hiking into the British Mountains to whitewater rafting down Class IV rapids on the Firth River. Not to mention soaking up 24 hours of sunlight in the summer and viewing the northern lights in early fall. Just expect to do all of it surrounded by more caribou than people. Must-do: Hike the trail to Halfway to Heaven. It's a peak inside the park, and if you hike it around the summer solstice your shadow will extend through the valley below and onto the adjacent mountain. Here's a fun fact for your next bar bet: parts of Canada are actually south of California. 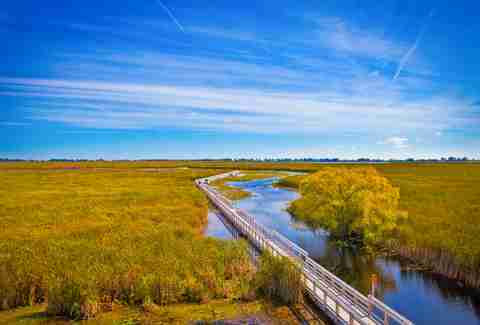 That's right, this park on the southern tip of Ontario is about a degree below the California-Oregon border. It sits on a point between Lake Michigan, Lake Huron, and Lake Erie, and is a popular resting stop for migratory birds and monarch butterflies heading south for the winter. So, yes, it's a top destination for birders. And another one for your next pub quiz: this prairie in Saskatchewan is the most popular national park in ALL OF CANADA. Indeed, because it's mostly flatland, rolling hills, and lakes, the hiking is easier and more accessible to those ill-prepared to brave the Rockies. It's also a huge destination for wakeboarding and water skiing, and in the winter attracts cross-country skiers from across the country. Must-do: Join Canadian cowboys as they round up the park's buffalo. Every summer you can tag along for three days. 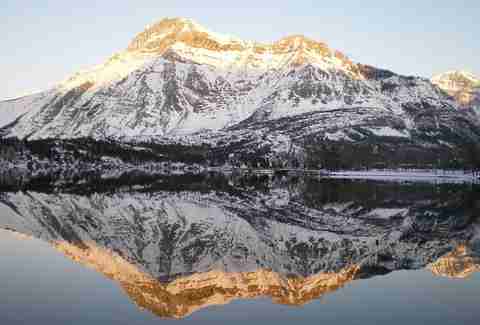 Connected to Montana's Glacier National Park, Waterton Lakes is the only park in the world designated a UNESCO World Heritage Site, a US-Canada peace park, and a biosphere reserve. It sits where the plains meet the mountains and has a distinct ecosystem that supports greater biodiversity than anywhere in the Rockies. The name of this park comes from a Cree word meaning "white bear" so it shouldn't come as a surprise that it's home to one of the largest polar bear denning grounds in the world. 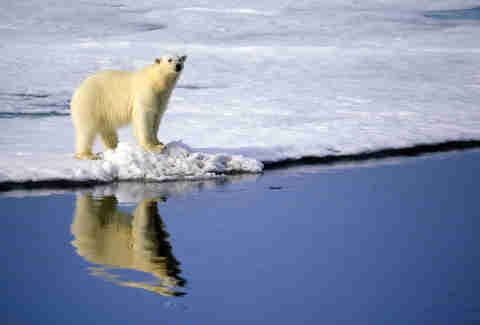 Yes, every February the tundra is taken over by... baby polar bears! Awwww. 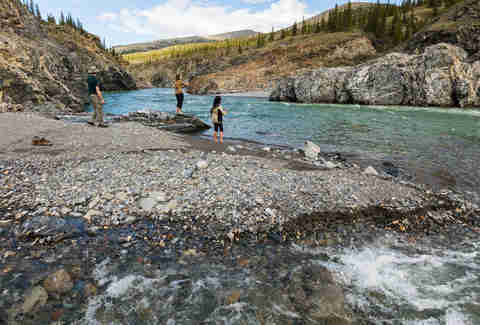 Only catch: there are no trails, roads, or other access points into this park; the only way to explore it is by guided helicopter tour, which are run by private operators in nearby Churchill and book up months in advance. Must-do: Go to see the polar bear cubs, duh. Just book early. Late February and early March are the best times to see the babies but the adults also crowd around the shores of Hudson Bay in October and November. British Columbia's been deemed by many an outdoorsman's paradise, and the best way to see it is in this national park on Vancouver Island. 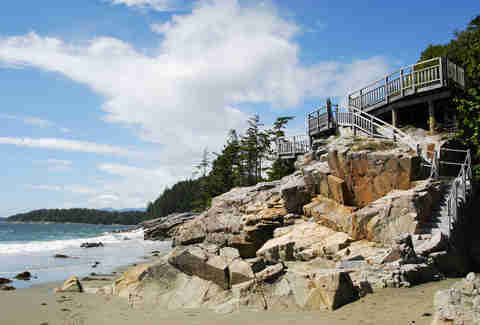 Pacific Rim has three separate units: the West Coast Trail, the Long Beach unit (where you can stroll the rocky, tree-lined shores of the Pacific), and the Broken Group Islands unit, an archipelago of rocks and islands only accessible by boat. Once you get past the water, you'll find yourself in a natural wonderland of waterfalls, rainforest, sandstone cliffs, and beaches, all of which can be seen by backpacking through the park. Must-do: Hike the West Coast Trail. You don't need to do all 47 miles, but if you go to the park, this is the unit to see. Part of what makes St. John one of the most underrated cruise destinations in the world is this park at the Bay of Fundy. Not only can you watch tides from the St. John River battle those from the bay in combative tide pools at Reversing Falls, but you can also hike up to the highest tides in the world at Hopewell Rocks. 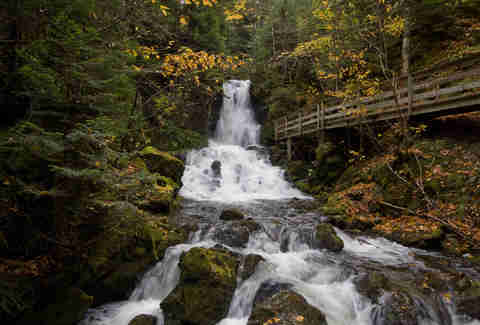 But beyond that, the park is full of thick forest and natural waterfalls and offers one of the best cruise port calls on the East Coast. Must-do: Snorkeling with salmon. Yep, you can get in the water and swim around with the insanely rare inner Bay of Fundy Atlantic salmon. 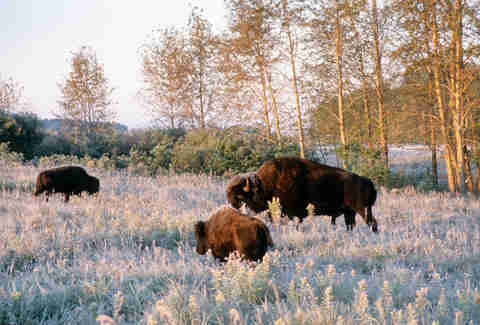 This park in the Manitoba Escarpment is top in the nation for spotting wildlife. Riding Mountain is relatively small -- only about 1,150 square miles -- but contains three different geological zones: aspen parkland, mixed-wood forest, and one of the last remaining deciduous forests in Central Canada. Because of this ecological diversity, the collection of animals that call the park home is unlike any you'll see in such a small area. 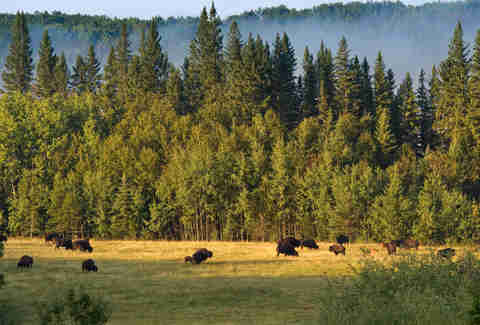 On a single day there, you can spot bison roaming through the prairies, black bears and moose in the aspen zone, and wolves and elk throughout. 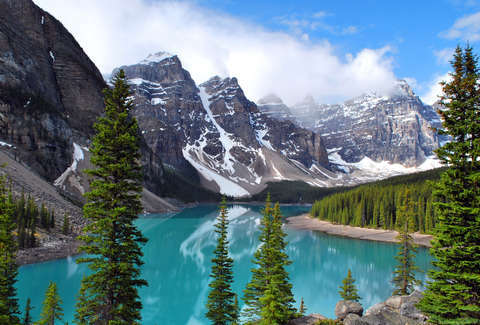 Banff might by the only Canadian National Park that most Americans can name, if only because it's been plastered on every postcard of the Canadian Rockies ever printed. And, yes, it's like Canada's answer to Yosemite and will be painfully crowded if you go during the summer, but that doesn't make it any less beautiful. Lake Louise is one of the top honeymoon destinations in the world, the nearby city of Banff actually has some pretty decent restaurants and breweries, and the Icefields Parkway -- which spans both Banff and Jasper National Parks -- may just be the most scenic drive in all of North America. Must-do: Visit Lake Louise -- it's so perfect you'll forget that you're surrounded by the same tourists you came to Canada to get away from in the first place. Matt Meltzer is a staff writer at Thrillist who pronounced it "Ban-fuh-fuh" until he was 12. Follow him on Instagram: @meltrez1.